David's Custom Shop P is quite possibly the ideal P pickup. It is never too much or too little of anything and has the perfect sonic shape. It is highly expressive with an open top end, slightly edgy upper mid range, just the right amount of low mid punch, controlled and never boomy on the bottom. The throaty growl of my bass is passed right through and it never gets lost in the mix; pick, finger style or thumbed it cuts right through even with dead strings and/or a buried tone knob. As far as I'm concerned the David Allen Custom Shop P sets the standard for live play or studio. I have been a guitarist for over 50 years. 20 years ago I started playing bass. I've owned lots of high end basses and used lots of different brands of pickups--Nordstrand, Bartolini, Seymour Duncan, Lindy Fralin, you name it. David's P-Bass offering--the 1088--is absolutely the BOMB. Sweet, warm, great fundamentals with a solid low end, and that great hollow P-bass tone you look for. Just great! If you are a bass player and are reading this review---do yourself a favor and get the 1088. It will be the best money you ever spend on a P-bass upgrade. I met you at the Amp Expo Saturday. I am 100% blown away with your work. I took one of your P-Bass pups home with me to put it in my beloved 1990 Yamaha Attitude bass. I never thought I would swap pickups until I heard what yours did.. This bass has been on stage with me 4 nights a week for the past 15+ years. I just installed your set and I am just amazed at how tight the low end is and how clear the highs are. The mids have an unbelievable growl to them that just screams 60's P-bass. It is as if a blanket has been lifted from my amp.. totally amazing. 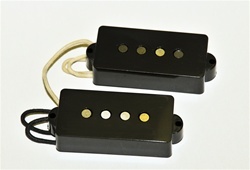 You are a master craftsman above all others and I am proud to have your pickups installed in my current bass as well as my upcoming custom Bluesman bass. Thank you for building a pickup that makes me inspired to play even more.